The Front side Air is considered a basic maneuver in today's new school era of surfing, and although, in my opinion, it is the easiest air to complete, it is still very challenging. Before attempting this maneuver you should have your cutbacks, floaters, and re-entry's down, and your surfing should be stylish and solid. Frontside airs can be performed in many different ways, but in my opinion look the best when you use the wave as a ramp to guide you in to the air, not when you ollie off the wave. Get a video of Taj Burrow, and study it, because nobody does frontside airs better than him. 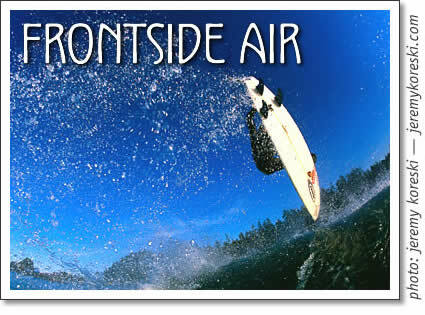 Frontside air tips: Peter Devries, surfer from Tofino, BC, explains the 'Frontside Air' in Tofino Time Magazine.